We equip students with the essential skills to effectively manage people and resources in today's business systems and organizational structures. Our graduates are prepared to compete and succeed in the modern job market with a premiere Big Ten educational experience. Learn about what is required to earn an undergraduate degree in management. Choose a degree option that best fits your career goals. Learn more about each specialization and what they offer. In addition to the College Degree Requirements, students will complete 21 hours of coursework for the management major. Students interested in pursuing the Bachelor of Science degree with a major in management will complete 9 hours of core management courses and one management option consisting of four courses (12 credit hours) to meet the requirements for the Business Core Advanced-Major (BCA-M). Management majors must declare one of these specializations as a formal option within their major. Multiple options may not be chosen. Students pursuing the Human Resource Management option may wish to consider selecting from the following courses to fulfill elective requirements within the College. Students pursuing the Entrepreneurship and Innovation option may wish to consider selecting from the following courses to fulfill elective requirements within the College. This option is open to students who do not wish to specialize in one of the specified options of the management major. 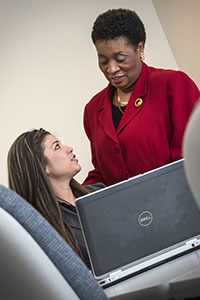 In addition to the three core courses for the management option, students must take 12 additional hours (four courses): three of these courses must be selected from the management options (Human Resource Management or Entrepreneurship), and one elective from the list of management courses (see catalog). Elective Management course (cannot be double counted with other degree requirements). Students pursuing the General Management option may select from the course catalog to fulfill elective requirements within the College of Business. For detailed program requirements, visit the Undergraduate Catalog. For course descriptions, visit the Undergraduate Catalog Courses. For more information on majors in the College of Business at the University of Nebraska, go to our Programs page.